User frustrations are an excellent source of new product ideas. Starting with this observation, this article describes an approach that entrepreneurs can use to discover business opportunities. 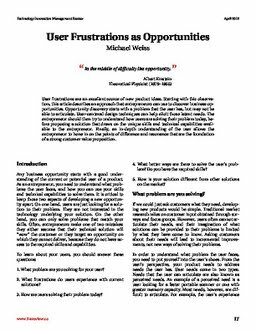 Opportunity discovery starts with a problem that the user has, but may not be able to articulate. User-centered design techniques can help elicit those latent needs. The entrepreneur should then try to understand how users are solving their problem today, before proposing a solution that draws on the unique skills and technical capabilities available to the entrepreneur. Finally, an in-depth understanding of the user allows the entrepreneur to hone in on the points of difference and resonance that are the foundation of a strong customer value proposition. Weiss, M. (2012). User frustrations as opportunities. Technology Innovation Management Review, 17–20.